Behind the bloody acts of terrorism, the mobs chanting with upraised fists, the backroom and front-page politics in the Middle East, stand powerful religious leaders cloaked in mystery and fanaticism. Spokesmen for the Despised lifts the veils, presenting eight vivid portraits of fundamentalist leaders who have turned their charismatic religious authority to powerful political ends. 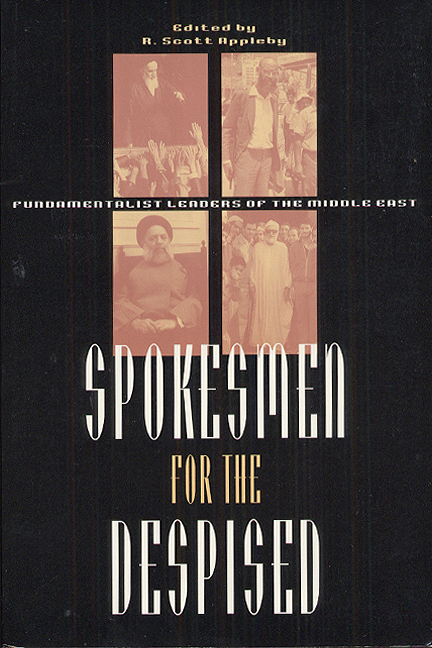 The deeds of the men profiled in this book make history and headlines, whether through the anti-American rhetoric of the late Iranian revolutionary, Ayatollah Ruhollah Khomeini; the violent acts of Hizbullah, the Lebanese Shi’ite movement headed by Sayyid Muhammad Husayn Fadlallah; or the group of Jewish rabbis who appear to have inspired the assassination of Israeli Prime Minister Yitzhak Rabin. No one better exemplifies this history-making than Shaykh Ahmad Yasin, the spiritual leader of Hamas, who from his Israeli jail cell continues to influence Hamas’s efforts to eliminate both Israel and the PLO. Also featured are the spiritual guides of the radical Jewish settler movement Gush Emunim, the Sudanese sponsor of "the Islamic Awakening," the preacher who inflamed Upper Egypt, and the ideological leader of the Zionist International Christian Embassy. These riveting biographies include interviews with true believers and bitter opponents, and in several cases with the subjects themselves, carefully placing the lives of these charismatic leaders in the contexts of their religious traditions and their varied social, political, and religious settings. Spokesmen for the Despised is an essential volume for anyone wishing to understand the relationship between religion and politics in the Middle East.